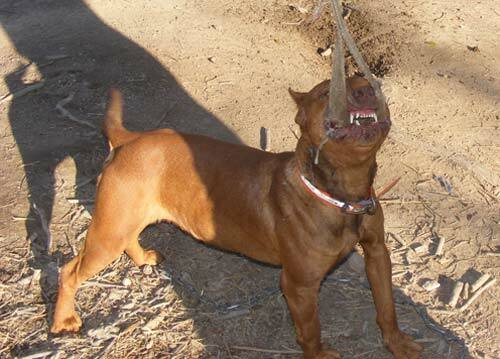 Bullseye is an American Pit Bull Terrier with Old Family Red bloodlines as well as world famous Sorrells blood. 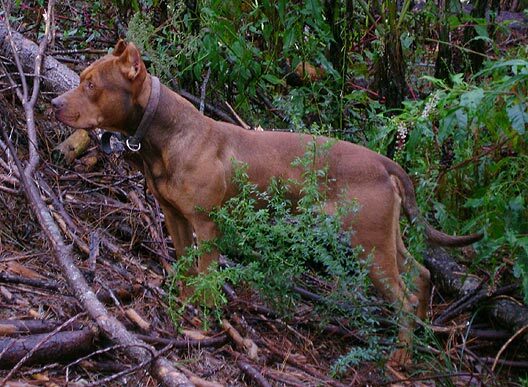 He has a dark red coat with darker ticking around his face and neck. Some call this color sable. The dark ticking on Bullseye's face creates a mask that looks like a widows peak on his forehead. 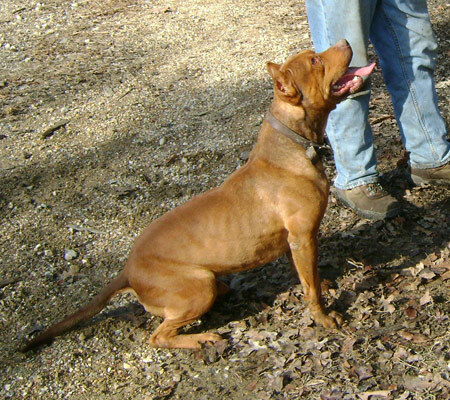 Although Bullseye is not a red and tan point pit bull, he does carry the gene that produces tri-color pit bulls with the red/tan or chocolate/tan point pattern. 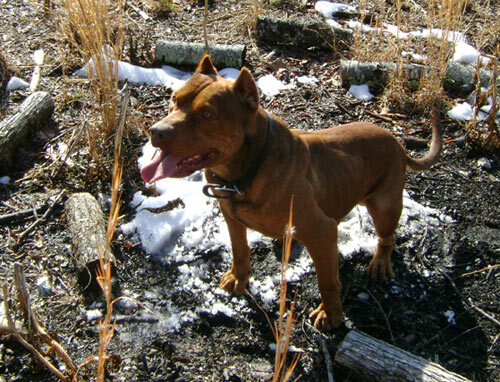 Old Family Red Nose (OFRN) bloodlines such as the Hemphill and Wilder bloodlines are known to carry the ticking that produces the mask pattern. 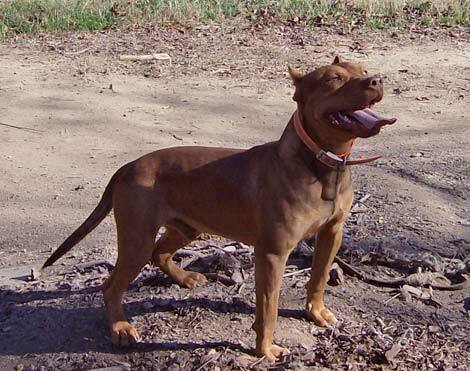 The Sorrells bloodline is known to pass on the gene that produces the tri-color red/tan or chocolate/tan point pattern. "Typical tan points are above each eye, on each cheek, on the lips and lower jaw, extending under the throat, two spots on the chest, below the tail, and on the feet to the pasterns and hocks, extending up the inner sides of the legs. 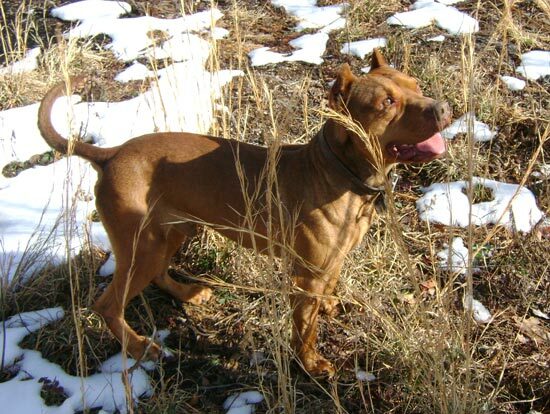 These tan points can occur on black or seal, blue, chocolate or red solid colored dogs." 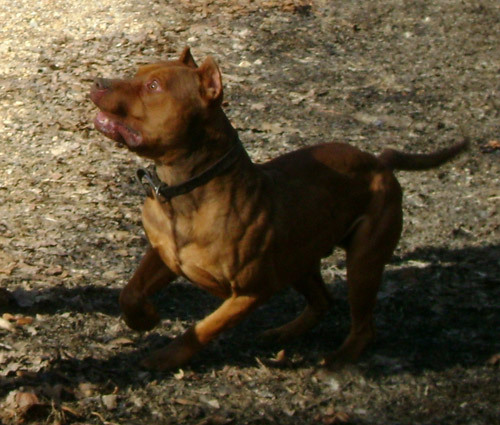 "In dogs that are red or buckskin, the Locus (B) alleles are expressed in skin color, most visible around the eyes and nose... A light brown or red nose is (bb), or homozygous recessive. Being homozygous recessive, both parents must contribute one recessive (b) gene to the offspring to produce the red nose. 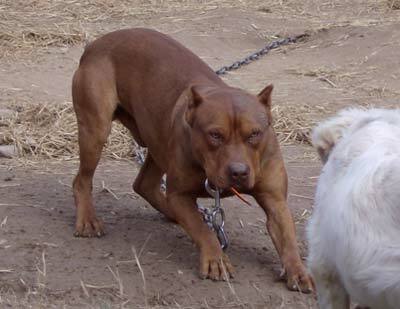 When breeding two dogs with the (bb) genotype, the only resulting combination in the pups would be ( bb) or red nose." 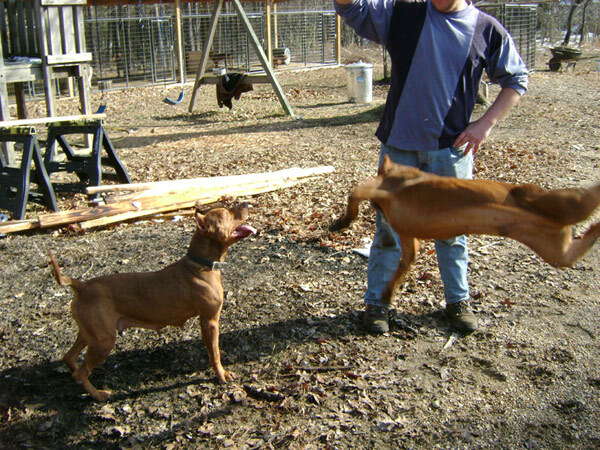 Bullseye was a very protective and calm dog. He loved playing with our kids. The photo at the top of this page shows how much he loved our daughter. He was OK with strangers as long as he could read that they were OK with us. He would let anyone pet him except those that he felt were up to no good. Dogs seem to be able to read those kinds of things. 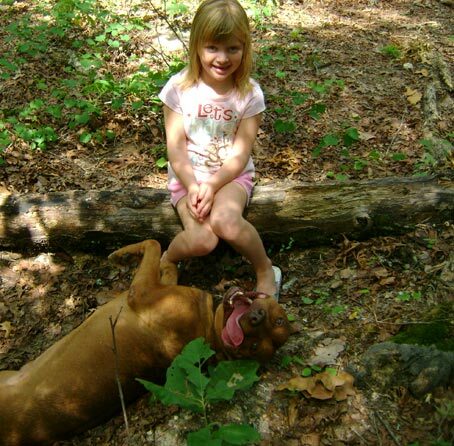 I remember one day when Bullseye was a young adult (around 1 year old or so..) and I had taken my kids to the creek to play, I turned to look in my truck for something, and I heard Bullseye bark. There was a man behind me... and Bullseye was behind that man. It was kind of like a stand off in a movie where people have their guns pointed at each other, both trying considering whether they should make their move. I asked the man what he was doing because he was pretty suspicious in full camoflauge (long sleeves and combat boots... in 95 degree weather). He was nervous about Bullseye being behind him and he quickly made an excuse that sounded fake to me and wanted to leave. I grabbed Bullseye, told the man to move on, and quickly loaded the kids and Bullseye into the truck and we went home. I was VERY proud of Bullseye for protecting us. 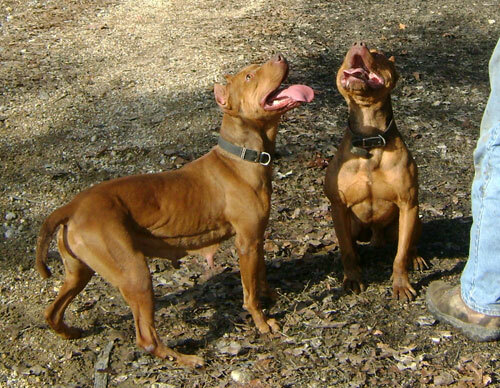 One of the many qualities that I love about the American Pit Bull Terrier is that these dogs will protect their loved ones with all they have. 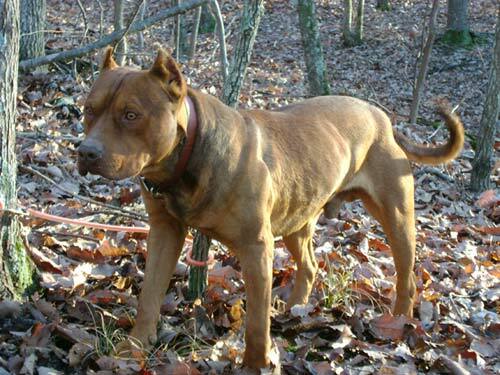 Another quality Bullseye had, and one that is the signature of the breed, is that he has an enormous amount of drive. 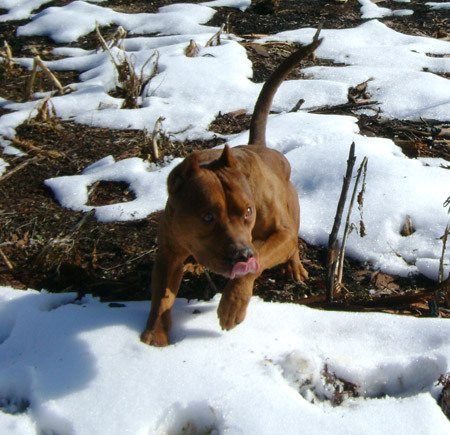 When we first started hog hunting with Bullseye, I always felt sorry for the poor pig, it was so hard to get him off the hog and he loved to hear them squeel. 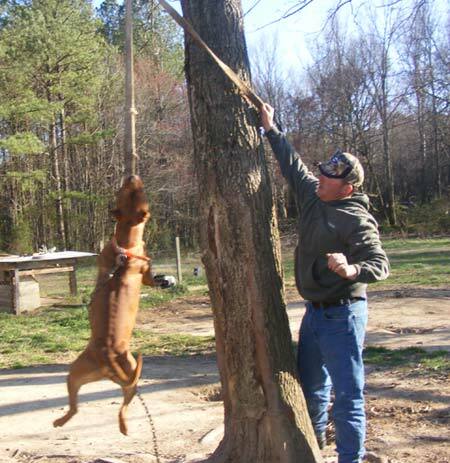 Mike loved hunting with him and said Bullseye was great with people and the other hunters could handle him easily. 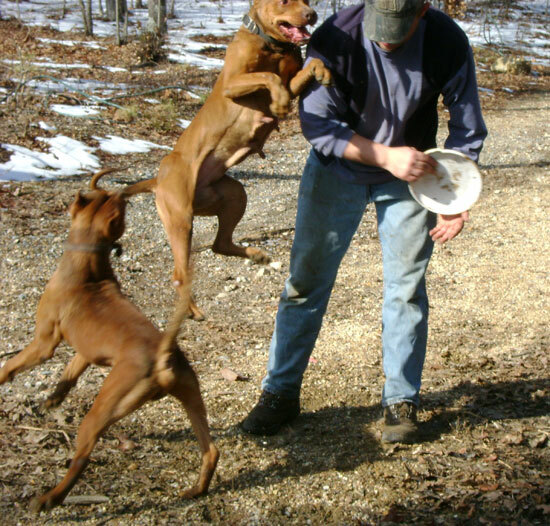 He also got along great with the hunting dogs well. In my mind, Bullseye was the perfect dog. I am not exaggerating one bit when I say that, it is honestly how I feel. I have never saw a dog that represented the breed better than Bullseye did. He is greatly missed. Bullseye was a chewer! 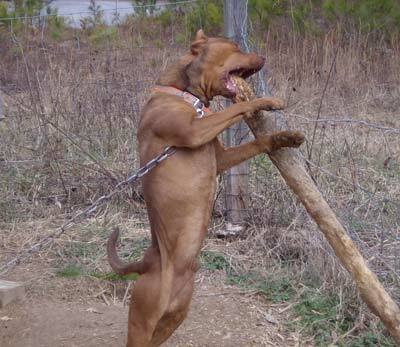 We eventually moved him to a 10' X 10' X 6' kennel in our yard, because he was bad about chewing anything within his reach. Bryant's Bullseye playing with a dog we had named Rufus.